Content by tag "Mimi Fox"
This year is the 50th anniversary of the release of The Beatles' Sgt. Pepper's Lonely Hearts Club Band, one of the most iconic albums in popular music history, so naturally a lot of musicians are celebrating it. 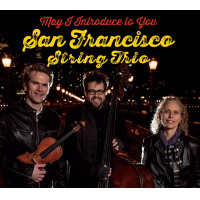 Here the San Francisco String Trio try their hand at interpreting the album in a jazz context. All About Jazz is celebrating Mimi Fox's birthday today!